Sophomore guard Justin Mazzulla dribbles the ball during Wednesday night's game against Vermont. The Colonials lost to the Catamounts 69–53. Men’s basketball was unable to gut out a second-half comeback after trailing Vermont for the entire first half Wednesday night. The Colonials came roaring back from a 10-point deficit to tie the Catamounts midway through the second frame, but they quickly lost momentum after Vermont (4–3) sank four consecutive three-point shots to come away with the 69–53 victory. For Joseph, the matchup was the first time he has coached against his alma mater since arriving at GW. He played for the Catamounts from 2008 to 2010, averaging 11.1 points per game. GW (1–6) focused its game plan on limiting Vermont’s trio of high-scoring starters. The Colonials succeeded in holding junior forward Anthony Lamb, sophomore guard Stef Smith and redshirt senior guard Ernie Duncan to below-average scoring on the night – but they still allowed Lamb and Smith to record double-digit scoring totals. “Our main goal was to slow down all three, mainly Lamb, but he did a good job passing the ball and other guys stepped up and made shots,” junior forward Arnaldo Toro said. Toro led the squad with 14 points and 11 rebounds on the night, his third double-double of the season. The Catamounts’ bench provided a boost to their shooting game and the Colonials failed to drain enough shots of their own to make up the difference. Vermont redshirt sophomore guard Ben Shungu and redshirt junior guard Everett Duncan entered Wednesday’s match with a combined four-made three-point shots to their names. Against GW, the pair went a combined 6-for-6 from beyond the arc. “They weren’t shooting very well coming into this game, so it’s unfortunate for us,” Joseph said. Vermont ended the night shooting a 52.1 percent clip, while GW ended at 31.7 percent. The Catamounts collected 11-made threes and limited GW to three on the night. The Catamounts took an early lead following two back-to-back three-pointers to open the contest. The two teams went on to trade baskets until Vermont began to break away at the end of the second half, leading by 14 points with less than four minutes to play. Vermont continued to attack the Colonials from behind the three-point line in the rest of the first half, garnering 18 of its 38 first-half points off three-point shots. GW’s leading scorer on the season, redshirt junior guard DJ Williams, had trouble finding the net to start the night. Williams watched many of his shots roll around the rim, going 2-for-11 from the floor and tallying only four points in the opening frame. Williams ended the night with eight points and four rebounds. The Colonials gained some momentum back in the final minutes of the first half behind their first-made three of the night from freshman guard Shandon Brown. GW outshot the Catamounts 8–4 in the final three minutes of the half. The Colonials out-rebounded the Catamounts on both sides of the floor in the half, grabbing 27 total rebounds. GW made 12 offensive rebounds to Vermont’s two. 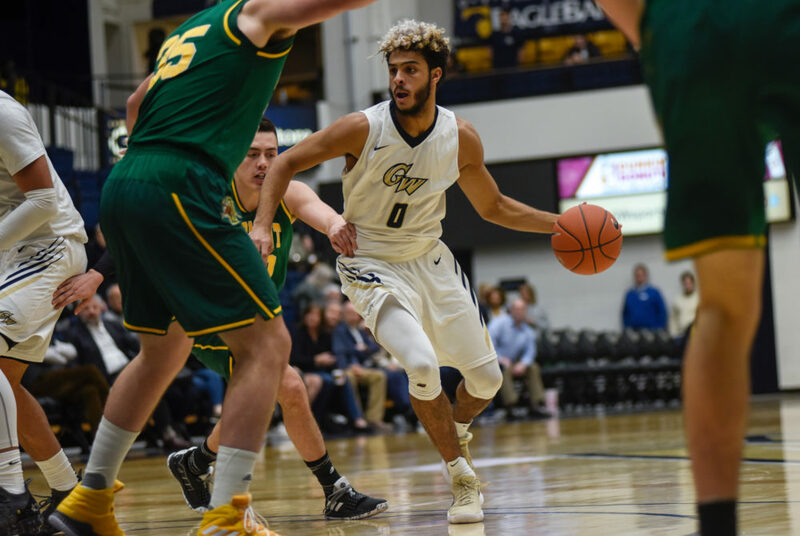 With GW down 38–28 coming out of the half, sophomore guard Justin Mazzulla tossed in a layup to score the first basket of the half and spark a 6–0 GW run. Toro brought GW within four points of the Catamounts off a layup from a hard drive to the basket. Mazzulla forced a Vermont turnover and scored off a breakaway to bring the Colonials within two. GW continued to capitalize on its offensive momentum and forced the first tie of the game with just shy of 11 minutes to play. Toro was a key component to GW’s second-half run, tallying five of his 14 points during the Colonials’ hot stretch. But GW was quickly stifled by an explosion of scoring from beyond the arc spurred by Duncan and Shungu. The Catamounts downed four three-pointers in just more than two minutes to break a 48–48 tie and finish the night on a 21–7 scoring run. “It’s been a rough year for us, but we just got to keep trusting the process, keep learning every single day,” Toro said. The Colonials will return to action when they travel to Princeton on Saturday. Tip-off is scheduled for 4 p.m.